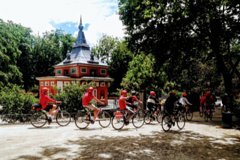 You will enjoy the best places from the RETIRO PARK of Madrid while you pedal for the city, enjoying the freedom and the advantages of travelling in bicycle. This excursion of 2 hours includes all the principal places of interest of the park. The tour begins from the park of the RETIRO, visiting the DOOR OF ALCALA, the great lake of the PARK, Monument of ALFONSO the XIIIth, PALACE OF CRYSTAL, CECILIO RODRIGUEZ'S GARDENS, GARDEN OF RECOLLECTION and ANGEL FALLEN DOWN (the unique monument to the devil in the world). Private Tour, beginning at any hour from 11:00 (advisable at this hour). The cost for person for a private tour is 35 Euros. If the client wants they can take photos and send it for WhatsApp or e-mail. The tour can be adapted for children from 10 years old and more. The tour carries out normally in English and Spanish, contact us to see availability for other languages.